I'm writing the next book in The Alchemancer series. It's called The Nullification Engine and should be out soon. As a way to keep readers updated on my progress and also so I can gauge the same, each week I take a look at my current writing progress and report it here. Also, I discuss some other areas revolving around the business side of things. I usually like to get these done on Saturday but decided to spent the day yesterday riding the mountain bike with the wife, so here we go with my usual update a day later than usual. I finalized discussions with a new editor. He's going to start with a manuscript refresh for The Hall of the Wood. That's a bit of news unto itself, so let's get into the next section. You can read the details here, but a quick summary is that I've pulled The Hall of the Wood from online retail shelves while the book undergoes a new round of editing and polish. There's a new cover coming too, which I'll reveal as part of the 2nd edition launch. I expect to have it all ready to go around late May or perhaps early June at the latest. One of the initial promotions for this re-launch is that for everyone signed up to my mailing list, I'll send you a free EPUB or Kindle/MOBI version of the new eBook. There's no obligation to review, so it's basically a free read with no strings attached. As noted, I've got a new book cover for the 2nd edition of The Hall of the Wood. This past week I finalized that with my book cover illustrator, so it's all ready to go. What happened to The Hall of the Wood?! I'm slowing down on blogging. I'll provide more details in a future post, but I'm finding I'd rather spend the time working on the current novel than writing up more posts. I suppose this is inevitable; there's only so much one can say on a day-to-day basis without getting burned out eventually. If you go back and look at previous tables, you'll notice the numbers are all different. 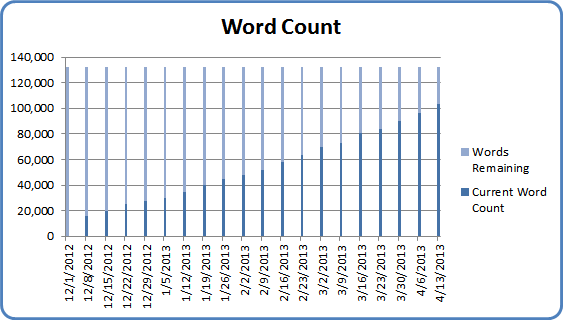 That's because my recordkeeping goes askew week-to-week based on the average number of words per chapter and the total number of chapters, both of which seem to have been changing a bit as I wind down this first draft. I started with 30 chapters. Now, I have an expected 22. Word count estimate was at 150,000 at one point. Now, it's at 132,330. I'm coming in with fewer chapters than The Five Elements, but each chapter is longer. 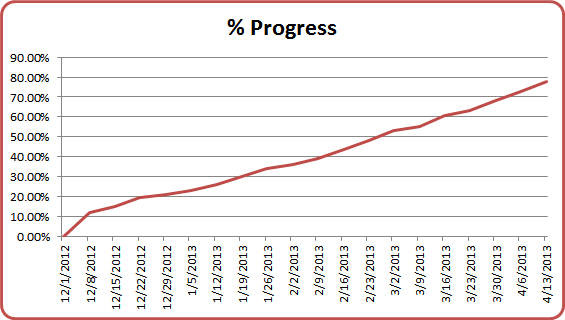 So, here's the current breakdown and I'm going to get back to writing. I might be able to wrap this first draft up in 5-6 weeks. Lots of insight into the writing process and the business of writing in this series of posts. A weekly summary of my writing progress and some discussion on the business of writing.